Here it has been raining for the whole week. On Friday we had very heavy rain with flash flooding. Thank God we didn’t have any episode of flash flooding. But the ground is saturated and any more rain will result in flooding. As it was raining whole week I was cooking only regular food and not much baking as it is hard to take photo of finished product. Finally as I need a post for Baking partner’s challenge I decide to make this chocolate truffle cake. It is really easy you need two days to make it. This month baking partner’s challenge was suggested by Suja of Kitchencorner try it. She suggested both flourless chocolate cookie and chocolate truffle cakes. I made the chocolate truffle cake. This cake is easy to make and full of chocolate yes. It has chocolate truffle you need to make a day before baking, and next day make the cake and stuff the chocolate truffles in it. This cake is not soft and is more like a fudge brownies. If you are chocolate lover it will be hard to resist this cake. It is really a simple recipe that is full of chocolate, with chocolate truffles, cocoa powder and also rich in butter and eggs. If you like fudgy brownies you are going to love it. My kids are fan of chocolate they like really well. This cake is not overly sweet. So you can try with sweetened whipped cream or ice cream. It is best when it is slightly warm. The chocolate truffle in the center gives a lava effect while having a bite. Yes chocolate oozed out in the center. Give it a try it won’t disappoint you. If you want to bake with us next month please shoot an e-mail. Chocolate truffle cake is ultimate dream of a chocolate lover. Remove it and stir well with fork. Continue to heat and stir until you get finely mixed chocolate. Place this in the freezer for 15 minutes. Divide it into 9 equal parts and roll into balls. Place the truffles into paper lined plates and place in the freezer. Preheat the oven to 325 degree F. Lightly coat the inside of muffin tin ( 3 inch diameter cups) with melted butter. Set this aside. In a sifter combine flour and cocoa powder. Sift and keep aside. Melt chocolate and butter in a microwave and stir until smooth. Place egg, egg yolks and sugar in a bowl and beat on medium high heat with an electric mixer. add the butter chocolate mixture and beat for 15 seconds. Fold in the dry ingredients along with vanilla extract. Fill three forth of each muffin cup with the batter and bake for about 5-6 minutes. Remove the truffle from the freezer. 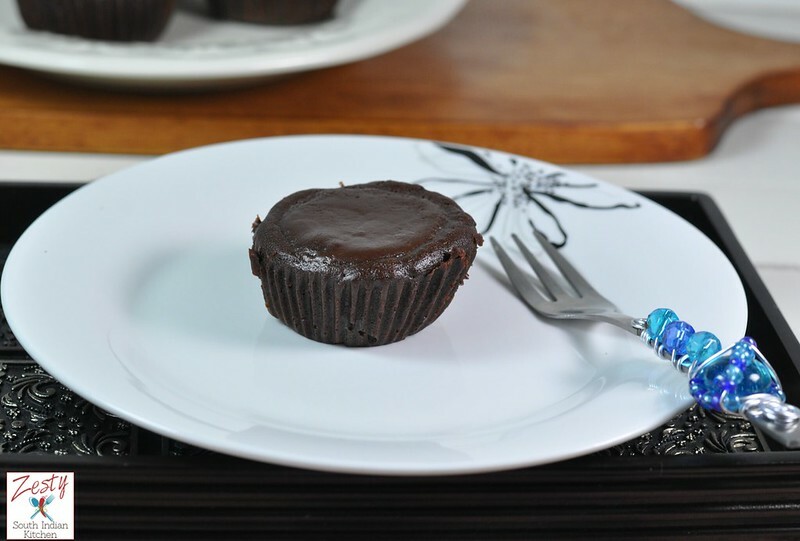 Quickly take the muffin tray from the oven and press one truffle each to the center of the muffin. Immediately return the baking pan into the oven and continue baking until a toothpick inserted into the cake (not the center truffle portion but the edge of the cake) comes out clean. It will take 20 minutes.. Cool in room temperature for 20 minutes. Run a knife around each cake to loosen it and then gently pull the baked cake out of the cup. Serve while still warm with whipped cream or ice cream. Whohoo! What an amazing recipe, Swathi! Death by chocolate! Love it! Pinned and tweeted! loved the use of paper liners,looks yummy!! Chocolate truffle cake looks so delicious and yummy. Just mouth watering, I’m ready to steal that cup cake! Toooooo tempting! 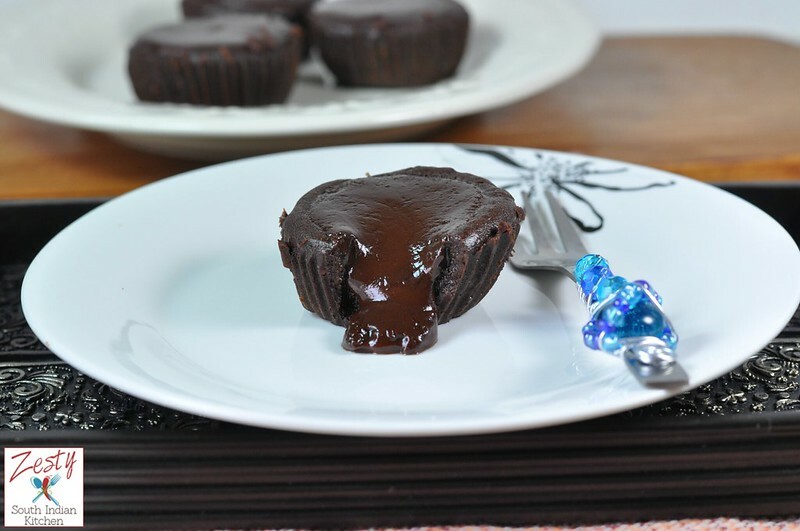 Swathi, these would definitely be a hit with *my* friends; they all love chocolate! Jean | DelightfulRepast.com recently posted…Pomme Rosti – Hash Browns with an Attitude? 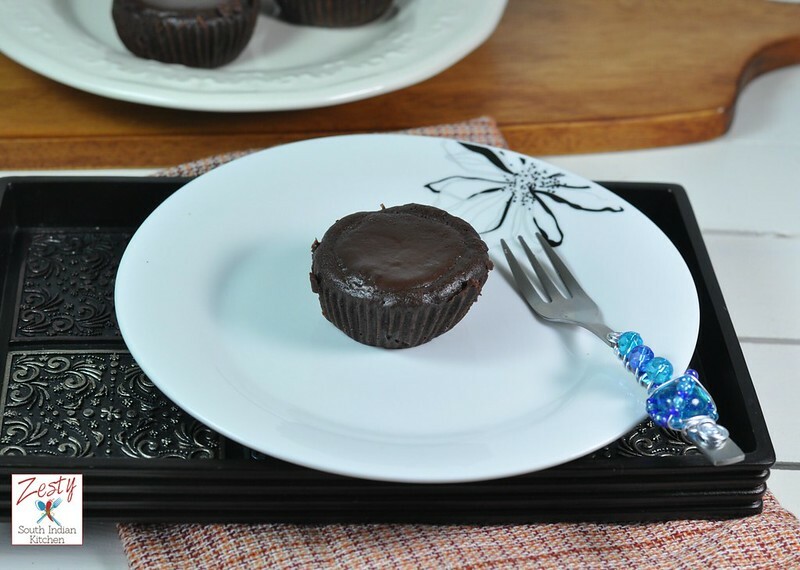 Swathi, your little Chocolate Truffle Cakes are beautiful, and I know they must be delicious! Yes, here in Texas, we are not used to this many rainy days in a row- we appreciate the rain, but it makes it SO hard for us bloggers who need sunshine for photography! 🙂 You did a great job! These truffles are a perfect special occasion dessert- I am pinning to serve for the next special celebration! Thank you! This looks absolutely delicious Swathi! Pinned and shared and hope to see you on Saturday! Joanne T Ferguson recently posted…Have Tutorials, DIY Projects & Recipes You Want To Share?